In the Windy City on Tuesday night, Phish put forth a discombobulated effort that featured legitimate individual jams but flowed like a pile of bricks. In a second set that didn’t really work, it seemed as though Phish had the pieces of a great jigsaw puzzle, but just couldn’t fit them together correctly. Pulling out a random assortment of songs in no apparent order or connection, Phish played a second set that sounded more like a mix tape than a live show. Not to take away from some of the higher moments of the night, they just happened individually with no real relationship to their neighbors in the set. The jumbled effort will likely go down as the “weakest” show of summer’s second leg, but given what’s been going down the last few weeks, everything is relative. That being said, the band opened the second set with the most significant “Number Line” to date; a jam that built off the Gorge’s version, and went far beyond. The band seems dedicated to using this as a consistent vehicle moving forward, and if the jams are like last night’s- that’s fine with me. 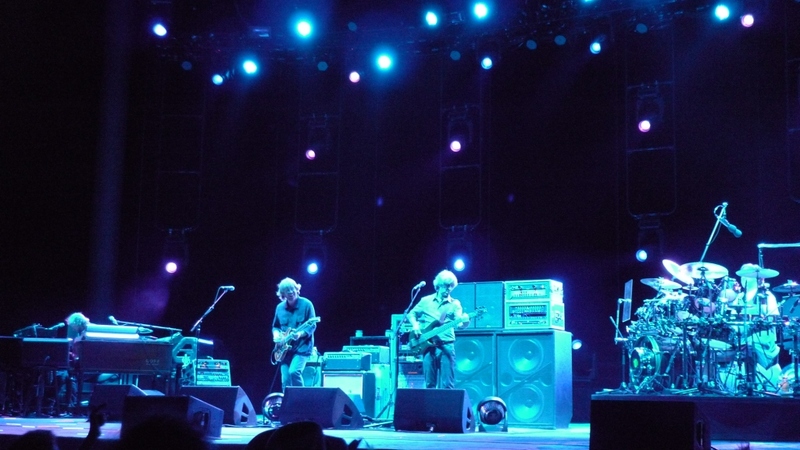 Taking the piece out into its most exploratory and uncharted psychedelic planes yet, Phish got into some slowed down, deeper grooves before this one was cut off a bit too soon. Moving through the murkiness into more transcendent territory, it seemed that the “2001” that was hanging in Washington might emerge from this jam. 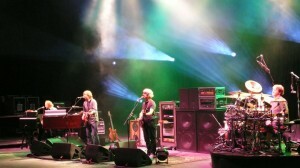 But as the music was passing through a mind-expanding canvas, Trey executed the jam with the ripping chords of “Carini.” While it was awesome to hear “Carini,” the jolt seemed unnecessary given their organic jamming these days, and they could have gotten there far more creatively. Nonetheless, as the bombastic song got going, the intensity was something to behold. While not necessarily longer than normal, the peak of the long-awaited 3.0 debut was monumental- possibly one of those “you had to be there moments”- as i have not yet heard the tapes. Just as abruptly as it started, Phish ended their dense, growling excursion with an odd switch into “Gotta Jibboo.” Yet, once again, once the jam got going, Phish shredded it to pieces. Boasting exciting dance grooves and soaring work by Trey, this rendition was yet another highlight of this awkward set. The mid-set “Theme,” “Wilson,” seemed like we were briefly transplanted into some random first set, and after forgoing endless creative places to drop “2001” over the past few shows, Phish chose this bizarre, disconnected point to let it fly. Yet when it did, the wide-open funk no-doubt brought some late set euphoria. Blasting into an shredding late-set “Chalk Dust,” everything just seemed out of place- wait, have I mentioned that? But as Phish started “Harry Hood” it was like a soft blanket catching us at the end of some strange trip, and as the band set their improvisational course, this one didn’t follow the norm. Taking the jam on a more ambient, impressionistic path, Phish crafted a unique highlight at the end of an odd night on the South Side of Chicago. 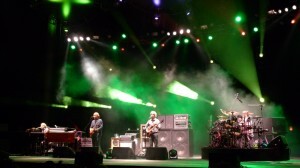 While a Phish show is usually greater than the sum of its parts- this one wasn’t. In fact, it was exactly a sum of its disjointed parts. Without very little dramatic and flowing improv that we’ve all of a sudden gotten used to, the entire set felt choppy and poorly presented, albeit well-played. But hey, all of a sudden, we are spoiled! As we enter the last four night-run of tour, Phish is sure to turn things up a notch as they pull back into the Northeast corridor. With four classic sheds hosting the last nights of a special summer, the final weekend is sure to be woven with tales of wonder. Darien > Hartford > Merriweather > SPAC- these should be heavy hitters. I’ll see you there. Set One Notes: In what was a virtual consensus for weakest set of tour, Phish never really got it going in the first frame. The only real pieces of note would be the third song “Ocelot,” whose jam crept into familiar territory, and “The Curtain (With)” with another huge, standout version of “(With).” For those of you counting bust-outs, the band played an early “Paul and Silas” for the first time in nine years (Worcester 11.29.98). 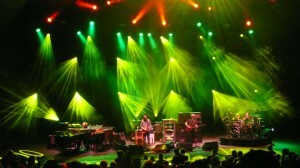 In addition, the band debuted a new Page song called “Windy City,” a slow-moving blues song that seemed like it wasn’t of Phish caliber. A solid ‘Time Turns Elastic” closed. This entry was posted	on Wednesday, August 12th, 2009 at 4:00 am	and is filed under Uncategorized. You can follow any responses to this entry through the RSS 2.0 feed. Both comments and pings are currently closed. the gotta jiboo dropped the funk. 2001 was awsome. Powered by WordPress v 5.1.1. Page in 0.689 seconds.